Another weekly award for goaltender Blake Pietila. The Howell native has been named the USHL’s goaltender of the week for the second time this season and third time in his USHL career. 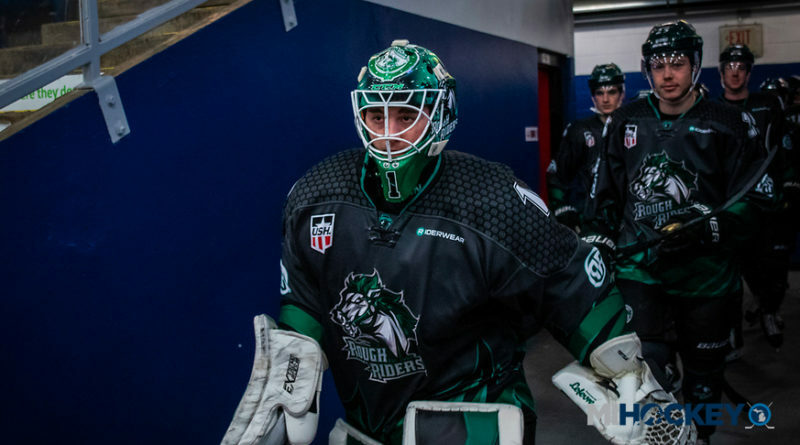 This time around, the Michigan Tech commit recorded a 25-save shutout on Friday against Dubuque and a 22-of-23 outing the next night against Green Bay to help his Cedar Rapids RoughRiders to a pair of wins. Pietila is 15-9-2-1 on the season; he has won six of his last eight starts. The Little Caesars and Compuware alum also holds a 2.65 goals-against average and .908 save percentage. It’s been a big year for him on the international stage, too; Pietila helped Team USA to a gold medal at the 2018 World Junior A Challenge with a 2.27 goals-against average and .917 save percentage in three outings. He wasn’t the only Michigan name honored, either; Muskegon’s Alex Yakovenko was named the defenseman of the week. The Russian native recorded two goals and an assist in the Lumberjacks’ 5-4 victory at Sioux City on Friday, playing to a +3 rating over the weekend. Yakovenko leads all USHL defensemen in scoring with 37 points in 37 games.